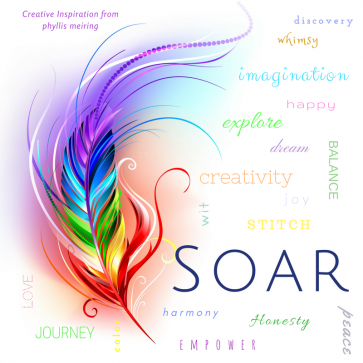 It is time to SOAR! Are you still riding high from the energy of Christmas? I cannot feel my feet! This year just seemed to breeze by as if I were riding on the back of a high flying dragon with a broken GPS. It was energetic and fast with lots of things to see and as usual, lots of things to do. How do you get through times like that? I have learned to listen for the whispers of my own voice especially in a crowd of people during a black Friday sale. That sweet honest voice said to exercise my color curating power and put together a toolbox to inspire you to SOAR; to discover creativity you didn't know you had. A toolbox complete with color and fabrics and notions and words and a gift custom made each month from a different artist with a card sharing their story and a word just for you. Every toolbox is different. Each month, new tools, new inspiration, a new story, new discoveries. This just may be what you have been looking for; click here for more information. You're getting this newsletter because you sign up to receive emails from us. I have lots to share with you in 2018 and this is just one of them. Thanks for signing up and have a wonder-filled creatively magic filled 2018 and thanks for sharing it with me!